The first things that come to mind when starting a Community Supported Agriculture (CSA) farming operation probably relate more to the what, where, when, and who of growing crops than to planning your website and writing newsletters. But the C in CSA does stand for community and getting and keeping members is essential to your success. There are several broad-based resources on starting a Community Supported Agriculture enterprise that have basics on reaching your customer base. A newsletter that is sent to existing members is probably the easiest place to start. Create a list-serve and e-mail members a weekly list of what is available. You can even print out a few copies for pickup with the produce for those members that prefer hardcopy. Add recipes for the ingredients in the share, particularly if they are somewhat unusual. You could even title it “What do I do with this?” and avoid your own set of emails with that question from members. Risk is part of being in a CSA and a newsletter gives you the opportunity to explain that risk to your members. One of Full Plate Farm Collectives’ recent newsletters said “Nature throws something different our way every season, and one of the most important traits of a good farmer is a constantly learning, self-educating and experimenting mind. We’re in safe hands with these guys!” (Katie Church, http://www.freewebs.com/fullplatefarms/) Then it becomes easier to break it to the members that no, there aren’t any tomatoes, yet. If you have a little more time, you can include announcements of special events or volunteer activities on the farm. You can also include community events that might appeal to your members, such as Field-to-Fork type events or crop mobs. And don’t forget to include some out-of-season emails to remind members that farming is a year ‘round occupation and to get them salivating for harvest – and signing up for next year! Of course, finding the time to write something weekly in the thick of the season can be daunting. Perhaps you have a member who would be happy to write up and send out your newsletter – and might even have the time to get creative! But a newsletter is meant to be a brief reminder to your members so save some of that creativity for the next level . . . .
Local Harvest: www.localharvest.org – post your business, location, and product in this great national website. Has free and low cost options for individual websites for farmers, very good reputation and well known! The Eat Well Guide: http://www.eatwellguide.org is a consumer oriented website where you can create a page with photos and link to your website, too. Farmer Faces (Small Farms Central): www.SmallFarmCentral.com – a low cost webpage great for CSA’s or markets that work as co-ops. Features a central page for your business with individual farmer ‘pages’ to highlight individual sellers. Word Press: www.wordpress.com- free blogs for individuals or businesses, with low-cost options for upgrades and more design capacity. Easy to learn with many helpful online tutorials. A website is a resource for your members, but also a way of attracting new members. We are lucky in Tompkins County to have a CSA fair where potential members can meet growers and gather information before deciding which CSA is the best match. If you don’t have that option, your website might be your primary tool for attracting new members. Most of us have used search engines to find what’s available in an area, from ice cream stores to Farmers’ Markets. Try googling CSA and your area to see what you find. Websites don’t have to be fancy to be effective and it is getting easier and easier to create your own website (see the Resource Spotlight for some suggestions). You can also create a page on a national website. From the Ithaca area, High Point Farms, LLC, has a page on www.eatwellguide.org and Kestrel Perch Berry CSA has a page on www.localharvest.org. As long as your website is up to date on information that might change (are you still accepting members? ), it doesn’t have to change constantly. However, a new picture or two or a recipe featuring a current share item help keep it interesting. Be creative and have fun! The WE Cooperative and Catalan Family Farm website has a haiku contest for their members (http://wecooperative.com/tag/community-supported-agriculture/)! 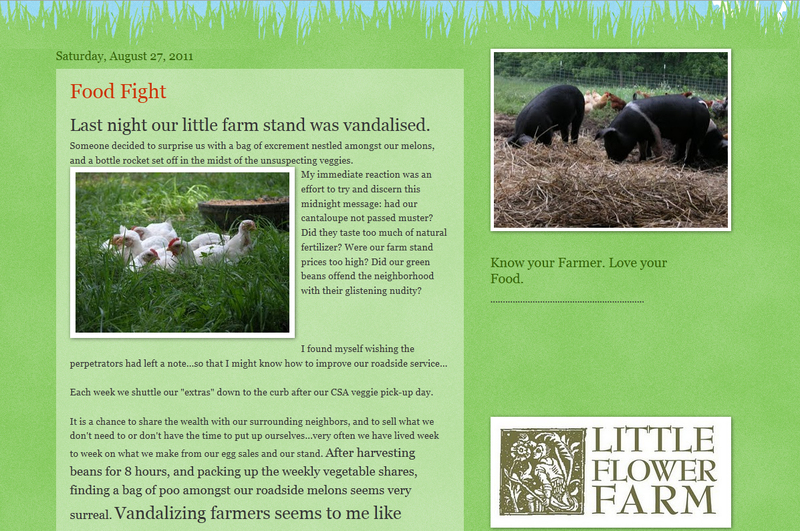 The blog from Little Flower Farm in Michigan combines wonderful story telling on the daily activities of family farming with pragmatic information on CSA shares and pickup details. A blog, or weblog, is a series of regular entries, or posts, with commentary or descriptions of events and graphics, photographs or video (http://en.wikipedia.org/wiki/Blog). They may be interactive, with the potential for readers to leave comments. A blog does require more time, as the expectation is that new blog posts will be available fairly frequently. 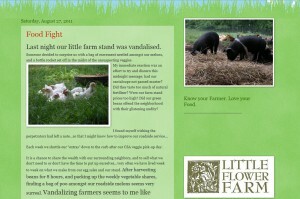 The blog from Little Flower Farm in Michigan is a good example. It combines wonderful story telling on the daily activities of family farming with pragmatic information on CSA shares and pickup information (http://littleflowerfarmcsa.blogspot.com/) . Blogs may be incorporated into websites, or be tied to social networking sites like Facebook or Twitter. In fact all your methods of communication can be linked together. Pete’s Greens Good Eats CSA has information and discussion items on the farm Facebook page (http://www.facebook.com/group.php?gid=48147346697&v=info) which links to the website where you can find their blog! Mano Farm has a Twitter feed for announcements, new photos and other items of interest to members (http://twitter.com/#!/manofarm). Check Michelle Podolec’s article on social media in this edition of Small Farm Quarterly for more information. So, start simple and see what works best for you and for your members. As you gather information and images and experience, you will continue to build the community in your Community Supported Agriculture enterprise! Elizabeth Lamb is a Senior Extension Associate with the NYS Integrated Pest Management Program at Cornell University in Ithaca, NY. She may be contacted at 607 254-8800 or eml38@cornell.edu.